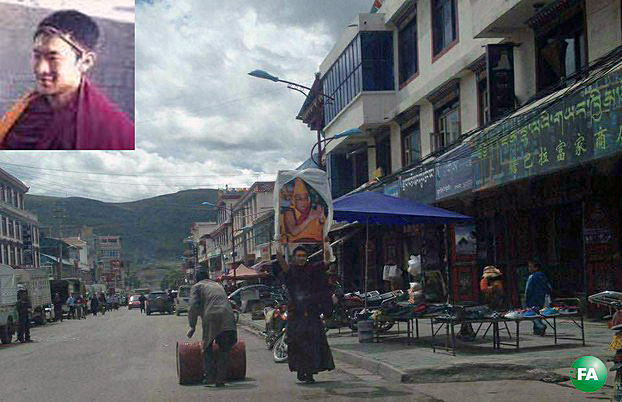 (TibetanReview.net, Sep11, 2015) – Jampel Gyatso, a 21-year-old monk of Kirti Monastery, was detained by Chinese police after he carried out a lone protest on the Dzongkar Street in Ngaba County of Sichuan Province on Sep 9, making him the 5th Tibetan to do so over the past less than two months. He carried a large portrait of the Dalai Lama over his head and called for freedom in Tibet as he staged his lone protest march around noon. Chinese police arrived on the scene shortly later and took him away, said the exile Tibetan Administration at Dharamshala, India, on its Tibet.net website Sep 10. The monk’s family is said to live in the county’s Meruma Town. Jampel Gyatso’s protest and arrest came two days after Lobsang Kelsang, 19, also from Kirti Monastery, was arrested at around 3 pm on Sep 7. Before that, on Aug 20, a woman named Dorje Dolma carried out a lone protest very early in the morning and was taken away by Chinese police shortly afterwards. The resident of Village No. 2 in the county’s Meruma Township had shouted slogans as she was arrested. Before Dorje Dolma, Woekar Kyi, an about 23-year-old mother of a four-year-old son and resident of Meruma’s Village No. 1, was taken away by Chinese police on Aug 15 after she carried out a lone afternoon protest on the township’s street. She shouted slogans, demanding freedom and the return from exile of Tibet’s spiritual leader, the Dalai Lama. And on Jul 15, Wangmo, 22, of Meruma’s Village no. 3 was held shortly after she started a lone protest march on the township’s main street, carrying a portrait of Tibet’s exile spiritual leader, the Dalai Lama.